Own Sons of Anarchy - Jax Skull Mug from Deff, DVD, Blu-Ray & 4K Video Specialists - Free UK Delivery..
From an executive producer of The Shield, comes a gripping drama that takes you into the ruthless underworld of outlaw bikers. The Sons of Anarchy live, ride and die for brotherhood. But as the club's leader (Ron Perlman) and his wife (Katey Sagal) steer them in an increasingly lawless direction, her son Jax (Charlie Hunnam) is torn between loyalty and the legacy in this adrenaline-charged first season.Special Features Audio Commentar.. Hang on for this high-octane thrill ride that goes even deeper into the gritty world of an outlaw motorcycle club! Reeling from the combined pressure of an ATF crackdown and an unprovoked murder, the Sons face a far more deadly threat from a cold-blooded enemy who will stop at nothing to drive them out of Charming - for good. As Jax and Clay square off over questions of leadership and loyalty, lines are drawn and chaos reigns as the clu.. 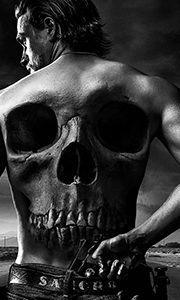 The sins of the father come crashing down on the son in Season Three of Sons of Anarchy! Chaos and confusion reign after Jax's infant son, Abel, is kidnapped and Gemma (Golden Globe winner Katey Sagal) is framed for murder. When Abel's trail leads Samcro to Ireland, secrets are revealed and the bonds of brotherhood are shattered. Jax is left reeling with more questions than answers as he struggles with the legacy of his father, the futu..
Ride full-throttle with the Sons of Anarchy into the most intense, adrenaline-charged season ever! Out of prison and back in business, Samcro faces a powerful new nemesis as they forge an unlikely alliance and head in a dangerous new direction. As a deadly, internal power struggle rocks the club to its very core, Jax struggles with the legacy of his father and makes plans for the future of his family amid chaos, corruption, betrayal and..
Let the actions define the man. From creator Kurt Sutter comes the adrenaline-charged Sons of Anarchy, featuring exclusive extended "creator's cut" episodes and kicking into high gear with its biggest, most explosive season ever! As Samcro's new president, Jax is surrounded by ruthless enemies and gut-wrenching betrayal. With Gemma fighting for control of the family and a bloodthirsty Clay out for revenge, Jax finds himself haunted by t..
Ride with the Sons of Anarchy, and relive the adrenaline-charged show's most controversial and tension-filled season ever! With Clay and Tara behind bars, Jax looks to the future of both the club and his family, but can he possibly escape the bloody legacy of Samcro's deadly past? As he desperately pursues his father's vision of a more legitimate direction for the MC, Jax is met at every turn with external pressure, violence, treachery,.. Complete your collection and relive the heart-pounding adrenaline rush of the final season of Kurt Sutter’s explosive outlaw biker saga, Sons of Anarchy. Reeling from the death of the woman he loves, Jax Teller steers Samcro full-throttle down the hell-bound road to revenge, allowing nothing to stand in his way. The streets of Charming run red with blood as shifting alliances and fatal mistakes lead to chaos, betrayal, and all-out murde..
Hit the open road with the first three seasons of TV's most relentlessly exhilarating show. under constant threat from the law, dangerous drug-dealers and bloodthirsty rival, the leaders of the Sons of Anarchy motorcycle club - Jax Teller (Charlie Hunman), his mother (Katey Sagal) and his sinister stepfather (Ron Perlman) - also face events that spin out of control. from their small Californian town to Belfast, Ireland, secrets are reve.. Hang on for an adrenaline-charged, high-octane thrill ride into the dark, edgy underworld of an outlaw biker gang! Hounded by law enforcement and targeted by deadly rivals, the Sons of Anarchy control their small California town through intimidation and ruthless violence. But, as the gang heads in an increasing lawless direction, Jax Teller, the club's vice president, is torn between the bonds of brotherhood and the legacy of his father..
From creator Kurt Sutter comes Sons of Anarchy, the iconic, adrenaline-charged initiation into the gritty underworld of outlaw motorcycle clubs. Hounded by law enforcement and targeted by ruthless rivals, the Sons of Anarchy face an uncertain and increasingly lawless future. Meanwhile, Jax Teller is torn between loyalty to his brother bikers and the idealistic vision of his father as he faces bloodshed, treachery, and betrayal at every ..
Own Sons Of Anarchy Seasons 1 to 7 Complete Collection DVD from Deff, DVD, Blu-Ray & 4K Video Specialists - Free UK Delivery..
Own Sons of Anarchy - Anarchy Black Mug from Deff, DVD, Blu-Ray & 4K Video Specialists - Free UK Delivery..
Own Sons of Anarchy - Prospect Mug from Deff, DVD, Blu-Ray & 4K Video Specialists - Free UK Delivery..
Own Sons of Anarchy - Reaper Mug from Deff, DVD, Blu-Ray & 4K Video Specialists - Free UK Delivery..
Own Sons of Anarchy - SAMCRO Mug from Deff, DVD, Blu-Ray & 4K Video Specialists - Free UK Delivery..
Own Sons of Anarchy - Teller-Morrow Mug from Deff, DVD, Blu-Ray & 4K Video Specialists - Free UK Delivery..